Greek tennis sensation, who just beat out legendary multiple grand-slam winner Roger Federer had recently named Stalactites as one of his favourite eating spots. The restaurant in Melbourne’s CBD responded in kind promising it would name one of its souvlaki on the menu as ‘Tsitsipas’ if the Greek champion got through round 3. Well, he is way past that point and on his way to bigger things. Let’s see what Stalactites will do if Stefanos goes all the way to the end and wins the Australian Open. Who knows, maybe the management could reserve a special section in the restaurant in Stefanos’s honour? 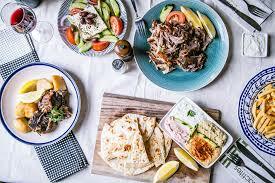 The restaurant has only bestowed the honour once before – naming a slow-cooked lamb souvlaki after Greek Cypriot Marcos Baghdatis during his fairytale run to the 2006 Australian Open final.